Remember back when CB radios were the big craze? Well, this record from 1975 was trying to cash in on the fad. I don't know, to me this guy doesn't sound like your typical CB trucker guy at all. He just sounds like a guy singing in a studio with a bunch of back-up singers. It's still fun to hear though. Hope you like it! LOL - what a coincidence... I decided to google up this album just a few minutes ago, and you're blog entry is the first result. 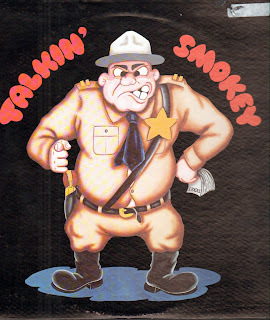 My dad helped design the Smokey character. I was given a cassette of this album from a former trucker from Washington back in 1976. I lost the cassette and have been looking for this since then.